I hope everyone had a great weekend! Hopefully, everyone didn't spend too much money during all of these great Black Friday and Cyber Monday deals! :P I was good and only picked up a few things, though I wanted more. I'm putting myself on a "low buy" until after the holidays, so I can spend more on others than myself. ;) Today, I have a few more polishes from Initial Lacquer. She is having 15% off her store right now and you can find the code at the bottom of this post and on my deals page here! Initial Lacquer Chocolate, Toffee or Me? has a sheer brown base with various shapes and sizes of green, purple and orange glitters. I used 2 coats with a top coat of Seche Vite. Formula was great; no fishing for glitter, it dried quickly and it dried pretty smooth without a top coat (I'm not sure why I added one looking back, habit I guess). 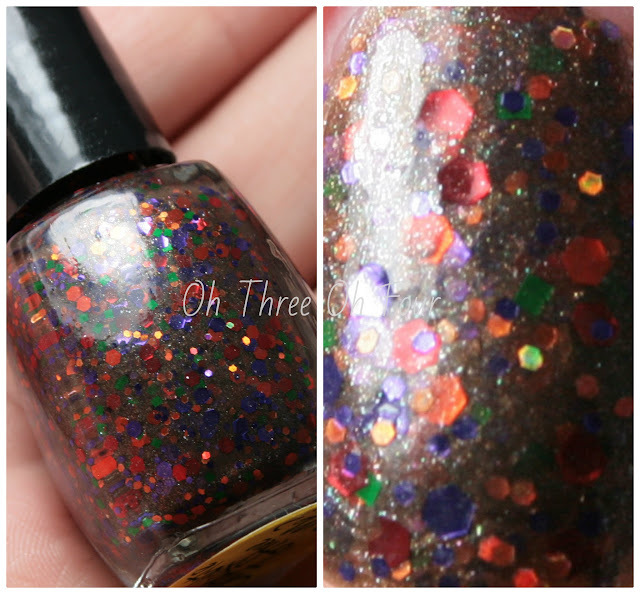 The medium sized hex orange glitters in this polish are holographic and they really pop against the brown base. Chocolate, Toffee or Me? reminds me of Halloween, who's to say you it can't be Halloween all year round though right. ;) The base could be more opaque with another coat, but I liked this polish with 2 coats and a loved that the base color didn't over power the glitters. 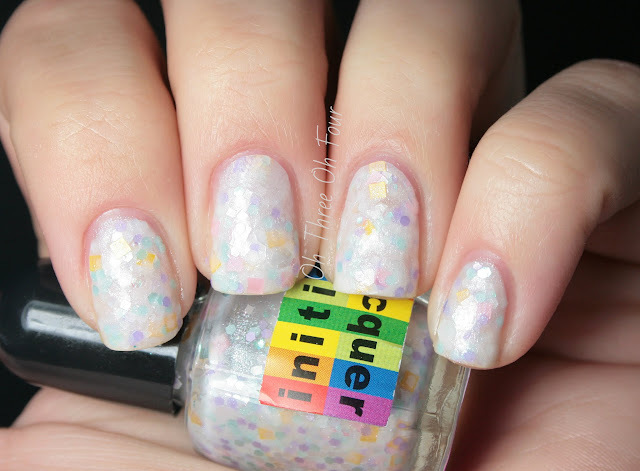 Paradise Kiss is described as a white shimmer base mixed with iridescent and matte glitters. All nails are 2 coats with a top coat of Seche Vite. Initial Lacquer can be purchased through etsy here. Currently her code BLACKFRIDAY15 is still active for 15% off your order, so stock up while they are on sale! ;) Also, find Initial Lacquer on Facebook here and Tumblr here to stay updated on new colors coming out, Snowy Owl looks really cute!